Jakov and Vicka are the only two human beings in the history of the world who were physically in body, taken by the hand by the Holy Virgin Mary, to Heaven, Purgatory and hell. Our Lady wanted to dispel atheistic thoughts that these places are not real – they exist, they exist, they exist. (Story drawn by the interview of Father Livio, director of Radio Maria) Father Livio: Tell me where you were and what was the time. Father Livio: Didn't you wait for the apparition of the Gospa? Vicka : No. Jakov and I were returned from Citluk and have gone to his home where there was his mother (Note: the mother of Jakov is dead now). In the house of Jakov there is a room and a kitchen. His mother had gone to take something to eat, because later we would have had to go to the church. While we were waiting, Jakov and I have started looking at an album of photos. Suddenly Jakov has gone down from the couch even before me and I have understood that the Gospa has arrived. She has immediately told us: "Vicka and you Jakov, comes with me to see the Heaven, the Purgatory and the hell". I have said to me: "It is all right, if she wants it". instead Jakov has told the Gospa: "You have to bring Vicka with you, because she has many brothers. Don't bring me that I am the unique child". He said this because he didn't want to go. Father Livio: Evidently he thought that would not have returned anymore! (Note: the reluctance of Jakov has been providential, because the story makes even more believable and real). Vicka: Yes, he thought that we would not have returned anymore and that we would have gone forever. I thought how much hours or how many days would have been necessary and I wondered me if we would have gone aloft or in low. But in an instant the Gospa has picked me up for the right hand and Jakov for the left hand and has opened the roof for letting us go. Father Livio: Has she opened everything? Vicka: No, she has not opened everything, but only that part that was necessary to pass. In few instants we have arrived in the Heaven. While we were climbing, we saw down in low the small houses, smaller than when they are seen in the airplane. Father Livio: But did you look on the earth down, while you were being brought aloft? Vicka: While we were being brought aloft, we looked down. Father Livio: And what did you see? Father Livio: I have read in some part, I don't know if it is true, that there was a door, with a rather elderly person nearby. Vicka: Yes. There was a wood door. Father Livio: Great or small? Father Livio: It is important. It means that so much people enter. Was The door open or close? Vicka: It was closed, but the Gospa has opened it and we have entered in. Father Livio: Ah, how has she opened it? Has the door opened alone? Vicka: Alone. We have gone toward the door and it has opened alone. Father Livio: The Gospa is the door of the sky! Vicka: On the right of the door there was S. Peter. Father Livio: How did you know that he was S.Peter? Vicka: I have immediately understood that it was him. With a key, rather small, with the beard, a little sturdy, with the hair. Father Livio: Was he standing or he was sit? Vicka: Standing, standing, next to the door. Just entered, we have gone on, walking, perhaps three, four meters. We have not visited the whole Heaven, but the Gospa has made sense of it. We have seen a great space wound by a light that it doesn't exist here on the earth. We have seen the people that are neither fat, neither thin, but all equal ones and they have dresses of three colors: the grey , the yellow and the pink. The people walk, sing, pray. There were some small flying Angels. The Gospa has told us: "Look at how much the people are happy in the Heaven". And a joy that cannot be described and that here on the earth it doesn't exist. Father Livio: The Gospa has made you understand the essence of the Heaven that is the happiness that never ends. "In sky there is the joy", she has told in one message. You have seen the perfect people without any physical defect, to understand that, when there will be the resurrection of the bodies, we will have a body of glory as that of Jesus. I would like, however, to know that type of suit they wore. Are tunics? Vicka: Yes, they are tunics. Father Livio: Did they arrive until the feet or they are short? Vicka: They were long and they arrived until the feets. Father Livio: Of what color were the tunics? Vicka: Grey, yellow and pink. Father Livio: According to you, do they have a meaning these colors? Vicka: The Gospa has not made sense of it. When She wants, the Gospa explains everything, but at that time She has not explained us why they have the tunics of three different colors. Father Livio: And the Angels? Vicka: The angels are like small children. Father Livio: Do they have the complete body or only the head as in the Baroque art? Vicka: They have the whole body. Father Livio: Do they wear the tunics? Vicka: Yes, but these tunics are short. Father Livio: Did you see their small legs? Vicka: Yes, because they haven't long tunics. Father Livio: Do they have some small wings? Vicka: Yes, they have the wings and fly above the people that are in Heaven. Father Livio: The Gospa has spoken about of the abortion. She said that it is a serious sin and will have to answer all the people that get it. The children don't have guilt of this instead are small Angels in sky. According to you, are the little angel of the Heaven the aborted children? Vicka: The Gospa has not said that the small Angels in Sky are the children of the abortion. She said that the abortion is a great sin and that will answer all the people that have done it,and not the children. Father Livio: Did you go in the Purgatory? Vicka: Yes, after we have gone in the Purgatory. Father Livio: Did you do so much road? Vicka: No, the Purgatory is nearby. Father Livio: Has the Madonna brought you? Vicka: Yes, caring for hand. Father Livio: Did you walk or fly? Vicka: No, we have flied. Father Livio: I have understood. The Gospa has transported you from the Heaven to the Purgatory, holding you for hand. Father Livio: What do you feel? Father Livio: I have just sent my book to the presses: "Why I believe in Medjugorje", where I wrote that in the Purgatory you hear noises as of weepings, of cries, of hits... It's right? Also I found it hard to find the correct words in Italian language to give the sense of that in that you say Croatian to the pilgrims. Vicka: Cannot be said that they feel him some hits and even that they feel him some weepings. There the people are not seen. It is not as the Heaven. Father Livio: What does it feel ? Father Livio: Does they beat between them? Vicka : You feels so, but I have not been able to see. Father Livio ,is difficult to explain a thing that you don't see. Is different to feel and to see. In Heaven you see that they walk, they sing, they pray, and therefore you can report exactly it. In Purgatory a great fog is seen only. The people that are found there they wait for our prayers to be able to go as soon as possible to Heaven. Father Livio: Do they attend our prayers? Vicka: The Gospa has said that the people that are found in Purgatory wait for our prayers to be able to go as soon as possible to Heaven. Father Livio: Listen me, Vicka: the light of the Heaven we could interpret it as the divine presence in which the people are absorbed where they are found in that place of beatitude. The fog of the Purgatory, instead, what is it to point out according to you? Vicka: For me, the fog is surely a sign of hope. They is suffering, but they has the certain hope that you will go to Heaven. Father Livio: The Gospa insists on our prayers for the souls of the Purgatory. Vicka : Yes, the Gospa says that they need our prayers to go in the Heaven. Father Livio: Then our prayers can shorten the Purgatory. Vicka: If we pray more, they go fast in Heaven. Father Livio: Now speak to us about the hell. Vicka: Yes. Before we have seen a great fire. Father Livio: Get away a curiosity: did you feel warm? Vicka: Yes. We were enough near and in front of us there was the fire. Father Livio: I understand. On the other hand Jesus speaks about of the "eternal fire." Vicka: You know, we have been there with the Gospa. For us it has been a different way. Do you understand? Father Livio: Yes, certain! You were only spectators and not actors of that awful play. Father Livio: Excuse me: but was the fire great or small? Vicka: It was a great fire. We have seen the people that were normal before entering the fire; then, when they fall in the fire, they are changed in horrible animals. I heard so many swearwords and the people that howl and shout. Father Livio: This transformation of the people in horrible animals is the state of perversion of the damned that they burn in the flames of the hate against God. I have a curiosity: do these people that turned into monstrous beasts had the horns? Father Livio: The horns that have the devils. Vicka: Yes. It is as when you see a person, for example a blonde girl, that is normal before entering the fire. But when it goes down to the fire and then she returns on, it changes her in a beast, as if she had never been a person. Father Livio: Marija has told us , in an interview , that when the Gospa has made you see the hell during the apparition without however to bring you in the afterlife, this blonde girl, when she has gone out of the fire, she also had the horns and the tail. It's right? Father Livio: The fact that the people turned into beasts also have the horns and the tail for me means that they have become in demons. Vicka: Yes, it is really a way of similar to demons. It is a transformation that quickly happens. Before falling down in the fire, they are normal and when they return on they are transformed. The Gospa has told us: "These people that you have found here in the hell have gone here with their own wish, because they have wanted to come here. The people that on the earth go against God they already begin to live only a Hell and then they continue it." Father Livio : Has the Gospa told it? Father Livio: Has The Gospa said therefore, if not really with these words, however doing express this concept, that go to the hell who takes to go it persisting to go against God up to the end? Vicka: Goes there who is against the wish of God. Who wants, it goes. God doesn't send anybody there. We have the possibility to save us. Father Livio: Doesn't God send anybody to the hell: the Gospa has told him, or you tell it? Vicka: God doesn't send anybody. The Gospa has said that God doesn't send anybody. We want to go there for our choice. Father Livio: I have felt to say or I have read from some part that the Gospa has said that we don't to pray for the souls of the hell. Vicka: For those of the hell, no. The Gospa has said that she is not begged for those the hell, but only for souls in the Purgatory. Father Livio: On the other hand the damned of the hell they don't want our prayers. Vicka: They don't want then and they aren't necessary. Several times, St. Veronica Giuliani was told about hell. Here is the time when Our lady informed her about the 7 worse places in hell. It scares me and helps me as priest to defend the Catholic faith. It also motivates me to give Holy communion on the tongue and with a paten to prevent crumbs of the Sacred Host from falling on the ground. This could happen when people receive Jesus in Holy Communion in the hands. Crumbs do fall from their hands and then people proceed to walk all over Jesus on the church floor. The fourth place is for confessors who have not told people confessing of the gravity of their sins and have absolved them without them being willing to try to stop committing over and over the same sin. Pretty scary for us priests who hear so many confessions. Daughter, I want you to describe the seven sites, the most painful, that are in Hell, and for whom they exist. 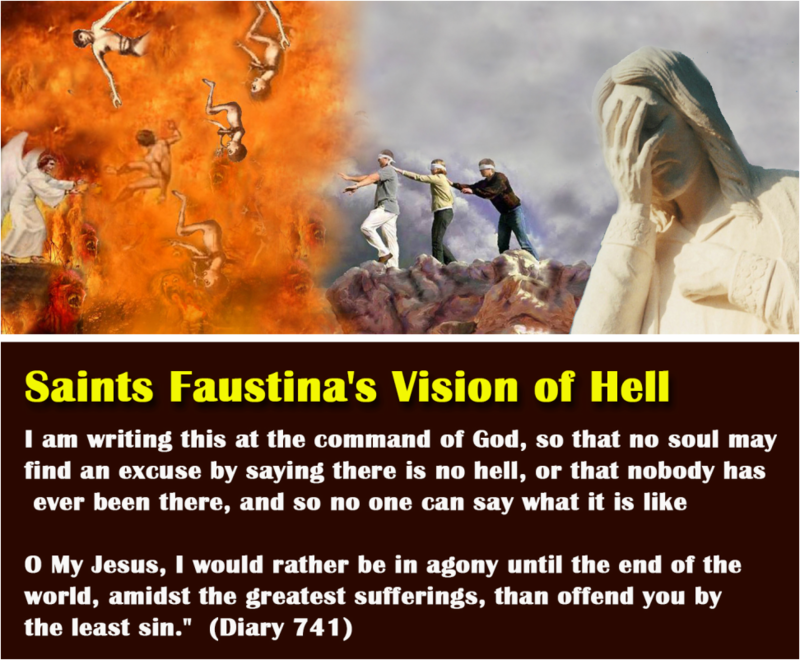 Saint Faustina - Conversation of the Merciful God with a Despairing Soul. Valentina, 29, comes from the Ukraine. Upon seeing her, you’d believe her to be a “normal,” young girl.